I took a leave of absence last Friday. My brother, Luke, and his girlfriend, Leigh, were in town to celebrate New Year's Eve with me and James which we did at The Sedgwick Stop, a neighborhood pub/eatery owned by my friend's sister. The food is fabulous - homemade pickles! - and a very relaxed atmosphere. During the evening a guy at a table next to us started dancing. He was, actually, good. I even got some video of that because it was initially amusing though it encouraged others to dance! I thought the house looked small compared to how it looks in the movie. I didn't realize there were so many trees! The next day, New Years Day, we had hoped to visit the Art Institute of Chicago but some places (such as the Art Institute) observe New Years Day as a holiday, apparently. They were closed. It was the one thing my brother really wanted to see. 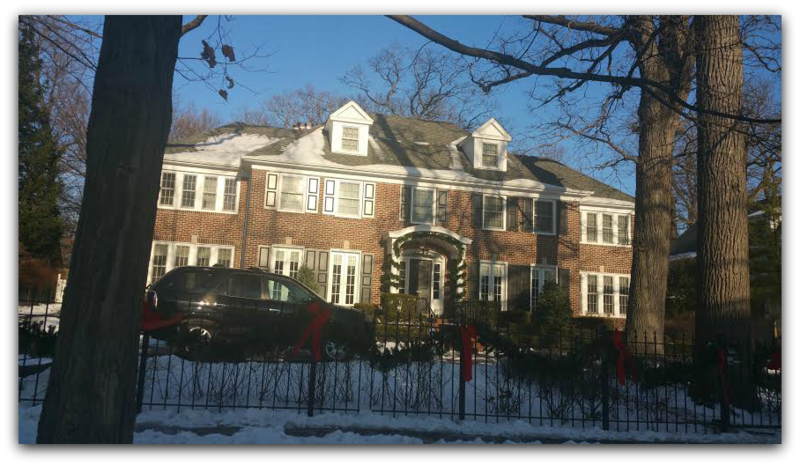 Instead, we drove up to Winnetka and saw the "Home Alone" house and took several pictures. There was another couple across the street from the house also taking pictures, ha ha. After which, we drove back down and then up Lake Shore Drive so that Luke and Leigh could get an up close daytime view of the city skyline. 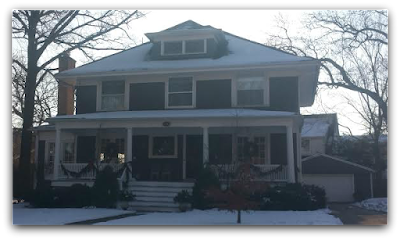 The "Murphy" House where the cops catch the Wet Bandits! Parking at the Cermak-Chinatown lot and taking the red line into the city we visited Wrigley Field, though it turns out there is reconstruction happening, which was also a bit of a bummer for pictures. By then it was unfortunately super chilling out (yeah, we felt the windy of the city) so we hopped back onto the red line for two stops and visited The Alley, which is still open until the end of the month (January 29th). It's one of those awesome stores you have to see! We all got tee shirts and James got a hat. 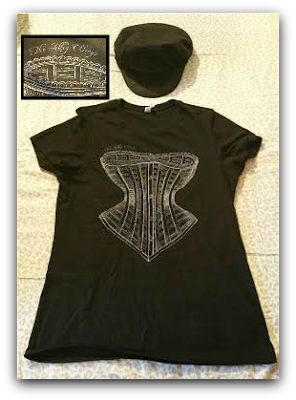 Corset print "The Alley Chicago" tee with James's hat - souvenirs for the day! It wouldn't be a Chicago trip without pizza, right? Hopping back on the train we went to Gino's East @ South Loop. The hour wait for the pizza is worth it. As we decided on what to order (a large deep dish for our party of four) Luke inquired about it being enough - he didn't believe two slices would be filling. Ha ha! He was in for a surprise! By the end of the night, I felt relaxed from riding the train, and could have fallen asleep easily. Luke and Leigh said goodbye and left to drive back down to Louisville. What did James and I do? Watched "Home Alone" to compare how the house looks to how it appears in the movie. We're nerds. What's your favorite thing to do in Chicago? Let me know in the comments!